This is a late (late) post about the events that took place at the beginning of this academic year at University of Oulu. At first, we had orientation days for all new students (exchange or degree) that arrived to complete their exchange or pursue a degree in the different faculties of the University, where we heard few welcome words from the different academic representatives and a quick cheers to the new students and to the old ones as well. Later on, we had a traditional opening ceremony which took place in the main hall –Saalasti sali- which is one of the biggest halls for ceremonies and events in the university with simplistic yet very modern decorations made by a Finnish artist -at least that’s what I have been explained before. The ceremony has a very unusual start since all the participants and the guests are waiting for the rector of the university along with the professors that have achieved the doctoral degree to march towards the center of the stage with their doctoral hats which are a representation of the symbol of liberty, scholarship and freedom of research (more details here: http://www.oulu.fi/confermentceremony/the_hat_and_sword). 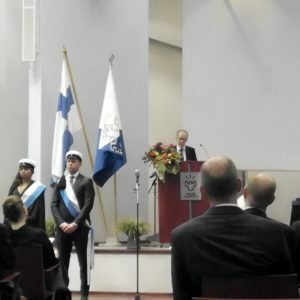 The rector, Jouko Niiinimäki, welcomed us with very sincere words in Finnish and in English distinguishing in his speech the achievements of the past year’ and the future goals for the upcoming year with a positive attitude towards better education and diversity. Some guests also presented their words of support towards the rector’s words and expectations of the education level of the university. A very interesting award of achievement was also granted for innovative solutions which have been awarded by international and national funding besides of other internal awards that marked the beginning of a new academic year. The brief intermissions were filled in by the Oulu University Sinfonica performing various iconic pieces of Jean Sibelius which entertained all the guests, staff members and students participating in the event. In the evening of the same day, an opening ceremony for the students took place -this year was held in the parking place outside the university. A small stage and a line of various tents created a celebratory atmosphere along with the students from all of the faculties joining the event. Bright and colorful overalls (haalarit) of different faculties and the white hats were all over the event arena. You could definitely feel the vibe of a student party from the cheers and laughter of the students heard from far behind. 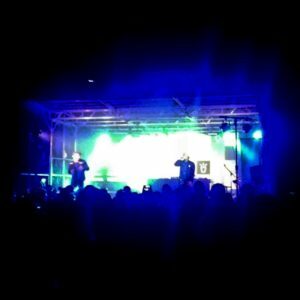 A few guests performers took over the stage and made the crowd dance and have fun. People were enjoying themselves a lot with food stands that were available, group activities, like dark pictures, face painting and other things to make the night brighter for the new students –and to the old ones- that enjoy this event. Many of the students after the event in the campus continued the celebration in the after parties that took place in many bars in the city center. So far, this academic year has started well for most of us. Many other important things are on the way but I will tell you more about them in another post!